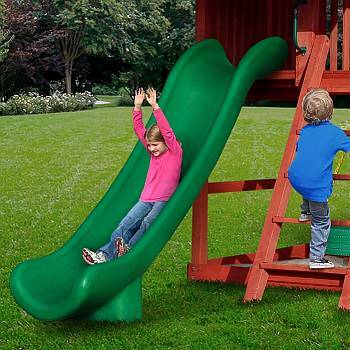 No backyard swingset, playset or playground is complete without a high quality, durable Slide feature. Slides give children the exhilarating feeling of Speed that is hard to resist. It is aften the center play attraction and your kids will enjoy going back up to the top and then glide down again and again. Slides are a safe place for children to experiment with what their bodies can do - how many ways can they go down (or up) that slide? 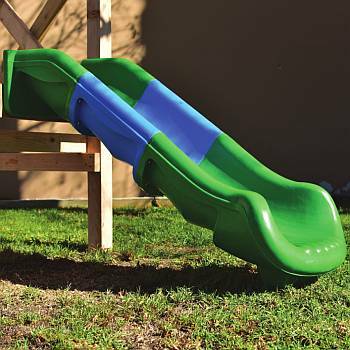 Having at least one slide plays an essential role in a childs motor skills development, confidence and is absolutely a fun component for any backyard playground set. To be honest, our basic wave slide is similar to what you can find at local Home Depot, Lowes, Menards etc. 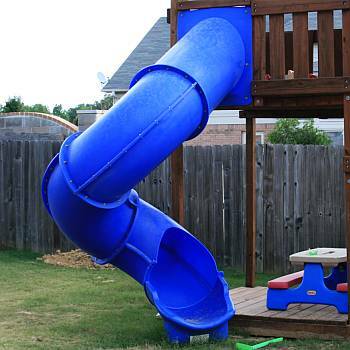 This type residential slide is specifically designed for small children. 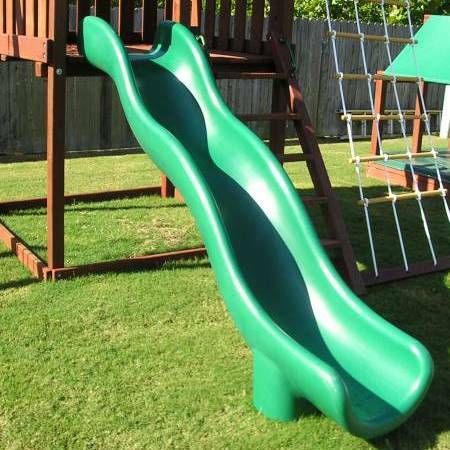 As a real life "Dad", I'd would never attempt to slide down that slide. However, I have ventured down all the aptly named "Super" slides below, as well as Sectional Scoop Slide, and I felt well supported and safe on them for me. It wasn't scientific, but as a "Bigger Sized" Dad, it seemed a pretty good test for me to see if it was safe for my children. We have two slides that can go on deck heights of 7ft, 8ft, 9ft, 10ft or higher. One is the Super Tube Spiral slide and the other is the Sectional Scoop slide. 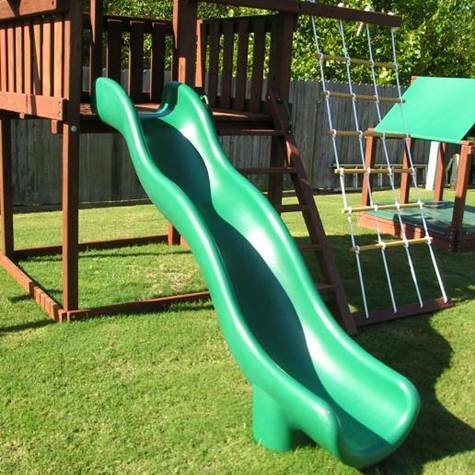 We are your source for playset slides: wave, scoop, spiral and tube! 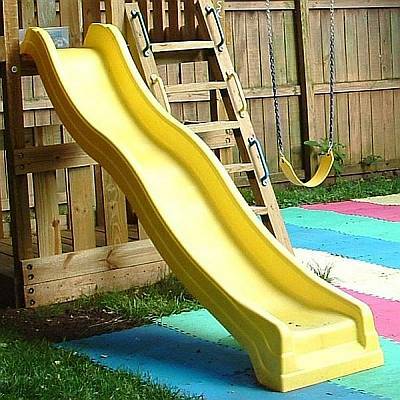 Due to the thermo dynamics and lower heat transfer properties of plastics, plastic slides are preferred over metal slides for play equipment. Although plastic slides may become as hot as metal, they insulate better and do not transfer the heat as quickly. Because of these properties, the Consumer Product Safety Commission (CPSC) recommends plastic slides and plastic surfaces over bare metal. Regardless of lower heat transfer properties, plastic play equipment can still become hot enough in extreme temperatures and direct sunlight to cause burns. Plastic slides are safe, tried and true, but as is the case with all playground equipment, parents and supervisors must monitor the children in their care, make certain that the equipment is appropriate for their age, and always check playground surfaces for excessive heat before allowing children to play. Reduce the heat by simply using a hose and cool water on the slide.